(left) The kid from Hell, and (right) the mom from Hell in Ju-on: The Grudge 2. The Skinny: Toshio and his grudge-bearing mother Kayako return in Ju-on: The Grudge 2, yet another entry in the highly successful Ju-on franchise. The film is a curious beast; the audience's over-familiarity with the premise and its "monsters" robs the picture of any palpable sense of dread, yet director Takashi Shimizu's willingness to not only experiment with nonlinear narrative techniques, but reinvent the series altogether makes this film a surprisingly compelling sequel. When James Whales's Frankenstein was released in theaters in 1931, audiences were reportedly terrified by Boris Karloff's depiction of Frankenstein's Monster. Seven sequels later the monster was a welcome, completely non-frightening presence in Abbot and Costello Meet Frankenstein. Today, Frankenstein's Monster probably would only elicit scares from the smallest of children. What happened? One word: overexposure. For a horror film to work, it has to tap into the audience's fear of the unknown. But as sequel after sequel keeps getting churned out, the monsters we were once frightened of (Freddy Krueger and Jason Voorhees being more recent examples) become little more than "old friends" that have ceased to shock us. Which brings us to Ju-on: The Grudge 2. At the time of this writing, there have been two direct-to-video movies, two feature films, and an American remake. Not only that, but director Takashi Shimizu is said to be prepping both The Grudge 2 AND Ju-on: The Grudge 3. Considering the fate of the monsters of old, can a certifiable horror franchise continue to scare us? In a word, yes. But the kinds of shocks that Ju-on: The Grudge 2 achieves are, for the most part, pretty cheap. The pasty little ghost boy Toshio (Yuya Ozeki) was creepy in the first film, and he elicits plenty of shocks when he pops up unexpectedly or scurries along in the background. But for those of us who've seen all or most of the films in the series, we've come to know the Ju-on legend intimately. Toshio is good for a quick scare, but in all honesty, he's a tragic figure, a portent of doom for sure, but he's not going to hurt anybody. Toshio's vengeful mother Kayako (a returning Takako Fuji) fares a little better in the chills department, but she, too, suffers from the fear-killing disease of familiarity. So how can a horror movie succeed when its very premise seems to have run its course? Simple: reinvent the formula. That's exactly what Shimizu does in this sequel. As negative as this review seems to be in the early going, the truth is I liked Ju-on: The Grudge 2. How's that for a shock? The premise is relatively simple: actress Kyoko Harase (Noriko Sakai) has been typecast in a slew of horror movies, becoming the veritable Jamie Lee Curtis of J-Horror. To make matters worse, an Unsolved Mysteries-type TV show has invited the actress to appear on their program. The film crew is going to spotlight a supposed haunted house, which, of course, turns out to be the cursed home of the previous Ju-on films. Kyoko reluctantly agrees to do the program, which goes off without a hitch despite a few weird incidents. Everything seems fine until crew members start dropping like flies. Kyoko also suffers the consequences of her trespass, as she experiences a near-fatal car accident. Amazingly, Kyoko survives, but her fiancé ends up in a coma. Even worse, the beautiful actress suffers a miscarriage. Or does she? A trip back to the doctor reveals that Kyoko is indeed still pregnant, but with what? And why hasn't she died like all the others? 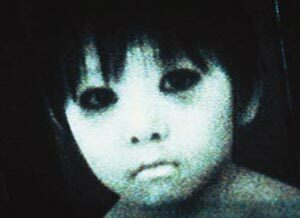 The answer to that question is part of the reason why Ju-on: The Grudge 2 works as a sequel. It retains enough of the premise of the original to be familiar to Ju-on lovers, but tweaks the formula just enough to make the narrative compelling, both for fans and non-fans alike. The concept for Ju-on is, in truth, better-suited for a single movie. The rules are pretty restrictive. Simply put, these ghosts just don't play fair. If you go into the haunted house, you die. And you can't do a damn thing about it. Wooden stakes and silver bullets are useless: the "Grudge" is inescapable. As such, there's really not much for a viewer to get excited about when every character's death is a foregone conclusion, and that's especially disconcerting when there's a sequel involved because it quickly becomes a case of "same old, same old." Yet the pregnancy angle in Ju-on: The Grudge 2 has a definite payoff, which even appears to have dramatic consequences for the third film, if and when it gets made. To put it coyly, the film plays fair in its reinvention. Instead of just throwing out all the rules, the film creates an "out" that is organic to the plot, and in doing so, let's the viewer know that all bets are off in the future. The idea of the same director remaking and sequelizing his own films ad nauseum seems like a dubious proposition, but if Shimizu continues to play with the formula, his decision to remain in the Ju-on-making business will be a tad more legitimate. That isn't to say the film isn't without its faults. Certain plotlines go nowhere, as evidenced by a bloodied diary that is made out to be a crucial piece of the plot, but amounts to little more than a creepy prop by story's end. (This is especially interesting, considering the diary does have a reason for existing in the American remake.) Besides its sometimes clumsy balancing act of horror and unintentional comedy (a scene in the wig department is alternatively creepy and laugh-out loud funny), the movie also is a bit too vague for its own good. Ambiguity is preferable to over-explanation, but the film would have benefited from a little more clarity, especially when it comes to the motivation for Kayako. Now I don't expect filmmakers to connect all the dots for me, but some "whys" need to be answered from time to time.